Back in the heady days of the financial crisis, I used to recommend Planet Money as a good way for non-specialists to learn about some of the basic economic and financial issues involved. Over the years, I’ve become less thrilled with the show, for reasons that will become obvious below. In particular, whenever Ira Glass dedicates a full This American Life episode to a Planet Money story, I cringe nervously, but I listen to it anyway, since, well, I’ve listened to just about every TAL episode ever, and I’m not about to stop now. But I can’t let this weekend’s episode, on Social Security disability benefits, pass without comment. In it, Chana Joffe-Walt “investigates” the Social Security disability program, first by visiting Hale County in Alabama, where 25% of all working age adults are receiving disability benefits, and then by talking to different types of people (lawyers and public sector contractors) who help people apply for benefits. The worst part of the episode comes at the end, where Joffe-Walt claims that the Supplemental Security Income program, by paying benefits to poor families with disabled children, discourages children from doing well in school and from seeking work as adults, because either would cause them to lose their benefits. (“One mother told me her teenage son wanted to work, but she didn’t want him to get a job because if he did, the family would lose its disability check.”) On that topic, I’ll just outsource the rebuttal to Media Matters, citing the National Academy for Social Insurance and the Center for Budget and Policy Priorities, among others. But the story as a whole suffers from the same kind of facile extrapolation from the individual story to national policy. The first half (on Hale County) winds up to the following punch line: There are lots and lots of people receiving disability benefits, and they receive lots and lots of money in aggregate, because there aren’t enough jobs where you can sit down. Or, rather, that’s Joffe-Walt’s conclusion from talking to people in Alabama: the reason they can’t even imagine working with back pain, and she can, is that they don’t see any jobs around where you can sit down. Only then, as she pulls back the camera, the problem becomes the decline of American manufacturing, lost jobs, and newly unemployed factory workers without the skills they need to find new jobs. But which one is it? Is it too many jobs where people stand up (the problem in Hale County) or not enough (the decline of manufacturing)? Probably the latter: the story makes more sense as one where one set of jobs goes away, leaving people unable to get the jobs that are now available, and they turn to disability insurance instead. But that doesn’t explain Hale County, where there are no sit-down jobs. Then there’s the weird way the whole episode treats welfare reform. “Ending welfare as we know it” comes up in a couple of places: first as a positive example of what we should be doing (moving people from passively receiving benefits to working), and later as a cause of the rise in disability claimants. On the latter point, Joffe-Walt cites the fact that federal welfare funding declined, shifting the burden to the states, which gave the states the incentive to push people off welfare and onto disability. True enough. But she overlooks the big story. Federal welfare reform set lifetime benefit limits, meaning that, after a few years, you get completely cut off. After some welfare recipients got jobs, this was the factor that ensured that welfare rolls would go down. Many people who couldn’t work and got welfare now can’t work and get disability. That’s a good thing—especially if the alternative is pushing them onto the streets. Leaving all that aside, though, the story boils down to the idea that disability benefits are valuable, so people are trying to get them, framed as some sort of epiphany. “Holy cow, Batman, incentives matter!” But this is just social insurance 101. When designing programs that help poor and disadvantaged people, we already try not to reduce their incentives to work too much. That’s why programs phase out over income ranges, that’s why we have the Earned Income Tax Credit, that’s why we have a debate every time long-term unemployment benefits have to be reauthorized, and so on. Is this some sort of national scandal? No. There are people who are disabled and can’t work, they are entitled to a decent existence, the rest of us who can work should pay for it, and there is going to be a gray area where some people will be motivated to try to get into the program. That’s life. That’s the employment-to-population ratio, from the incredibly useful Calculated Risk. Since the denominator is all working-age people, this chart reflects any growth of disability recipients. 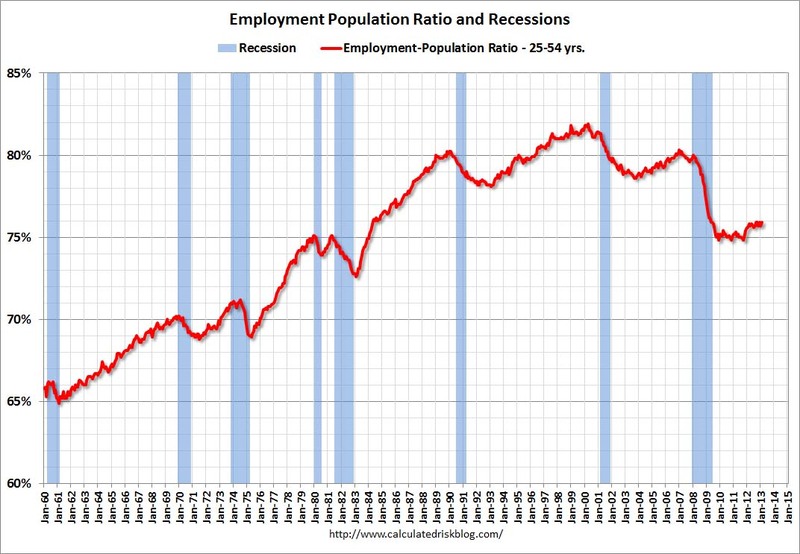 And do you see some huge invisible force that is pushing down the employment ratio? I don’t think so. This chart tells the usual story we all know. The economy was very strong in the late 1990s, probably unsustainably so (with unemployment below the long-term sustainable rate, according to the macro guys). We had a recession, and then employment recovered to roughly the sustainable rate. Then we had the financial crisis and a huge fall in employment. Sure, a rise in disability rates could mean the employment-to-population ratio is lower than it otherwise would have been. But it’s not a new way of thinking about the economy. And if we’re getting better at diagnosing mental illness and providing benefits to people with mental illness, that’s a good thing. I was going to end by trying to explain why I love This American Life and used to like Planet Money (see, for example, the episode where they talked to a chemist about why gold ends up becoming the basis for money in many developing societies) but don’t like episodes like this one. But Ira Glass is one of the savviest people in radio or any medium, so he can figure out what’s going on with the show he co-owns. This entry was posted in Commentary and tagged disability insurance, media, social insurance. Bookmark the permalink. I agree that Planet Money was an awesome programme at the height of the financial crisis and has declined somewhat since. And of course loved the gold episode. When they talk of insurance or demographics macro they tend to fall into the “inter-temporal transfer” fallacy, i.e. the idea that a lump of real value gets transferred from one generation to another rather than a floating claim to then-current value. I read this blog for Simon Johnson’s posts through an RSS reader. Is there a way to put Kwak in the headline, so we can pass by without being subjected to his overtly biased tripe? Thanks. One of the principle issues in Hale County (where my younger brother used to live FWIW) is that it’s an agricultural economy that went from cotton to . . . wait for it . . . catfish farming and processing. Yep, Hale County Alabama is the farmed catfish capitol of the U.S. So in the story (where this really never gets explained), Most folks are not able to conceive of, much less get jobs where you can sit down, because the economy isn’t built for it. And while it may not have been the story that NPR wanted to report, it IS a symptom of the current economy. When and where jobs are available (albeit in small numbers) they are often geographically isolated from large populations of available workers. That means that the workers either need economic incentives to move (which do not exist in current tax codes), or the business need economic incentives to move (which exist but seem to favor offshoring as opposed to intra-domestic relocation). Given Chana’s excellent reporting, I’d say the folks in Hale County ARE disabled, in that the economic incentives they need to seek and maintain work do not exist (and largely so because of national agriculture policies). James, I sure wish you would contact Ms. Joffe-Walt and and share your concerns with her directly. While I really appreciate your column here, she and Mr. Glass need to hear it more than we do, or at least as much. This kind of “reporting” gives cover to the Pete Peterson Catfood Commission, and that is the last thing we need. The PM fault is extrapolating from the anecdotal to the general, which may be great for TAL entertainment but don’t cut it for serious subjects. Kwak was right to call them on that. Two words summarize for me, in shorthand, why I can’t stand Planet Money anymore after its great start four or five years ago: Zoey Chace. Hey, I’m sure she is a wonderful intelligent person in real life. But her dopey-sounding voice and 30-second reports, to me, just stand for the entire dumbing-down, popularizing, facilely and falsely oversimplifying, superficial, trying-to-be-hip-more-than-right, ironic, don’t-hold-me-to-this lack of rigor I ordinarily run to NPR to escape from. I guess we should have known that anything called “Planet Money” was eventually going to succumb to a lack of commitment to serious journalism at some point. They’ve clearly made a choice to go for entertainment over intellectual rigor. I guess when NPR can’t afford to hire people who are subject-matter experts this is what we get – even at the nerdy end of the dial. It’s a shame, because it started out so promisingly. I imagined disability insurance was due to a strictly physical limitation: you can’t get out of bed or don’t have the mental capacity to work. What I learned was that your “disability” may be a lack of education or an unforgiving local economic environment. With that, physical ailments that would/could otherwise be overcome in a different place or with different educational access will now push you onto DI, which you don’t get off of. The structure of DI was news to me, and worthwhile to hear. I find it problematic when small sample sizes are used and extrapolated to the nation as a whole. Hale county is 16k people, and also 10k less people (40%) than 1930. Looking at that county, it is probably more important to look at what has happened to it specifically, and not think that its indicative to the whole country. I’d wager that those who have moved have not been on disability, leaving the percentage taking disability to increase. First off, why does a lawyer run an ad on my TV every other day offering to reverse a SSI ruling denying someone a disability benefit. Secondly, why is SSI, a program designed by FDR to prevent old people from dying on the sidewalks and back alleys being used as a work around of welfare reform. I believe an objective medical exam would reveal a lot of people with soft tissue ailments who spend a lot of free time walking the dog,playing catch with the kids, etc. I had the same reaction to the program — it seemed like nothing more than a more detailed version of the 47% argument. But my take-away message was that there are so many forces in our economic system that work against people who are not well-off, that it is not surprising they would look for any possible way of just surviving. The well-off keep finding more and more ways of extracting money from the non-rich (because “that’s where the money is” (most of it)), and then they complain when the victims try to work the few angles they have to save themselves. I agree generally but think that the “angles” are different for each program and with them being “worked” by some, the “fixes” will likely also penalize the legits. Point taking about both sides, though. 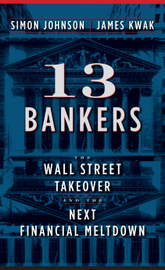 There need to be much more substantial fixes to stop cronie (non) capitalism in its tracks. Thanks for providing some real reporting for free on this site – seriously. Dylan Ratigan has re-surfaced to promote an organic farming franchise model. Nothing more than lowering the seed beds to make it wheelchair accessible. The rapid manufacturing of poverty in USA is not due to a breach in the man to land ratio, is it? A.J. Liebling used to write that there was no story more sacred to newspaper publishers than that of the “undeserving poor.” This would seem to be another example. In addition, we have the modern addition of professionals (radio reporters, for example) who don’t engage in manual labor having trouble understanding why it is a burden for those with back pain or 65 or older (in other cases than this). There are people working the system. But you can’t always tell. Years ago I looked at SSI and SSDI after seeing about my 100th apparently able-bodied, working-age African-American dude stand up during a community meeting and preface his statement on whatever subject with, “I’m on disability, and…”. So I ended up tracking this one guy for two years. We’d meet for lunch. He’d let me follow him around for a day while he made his rounds. Ended up with a little different story than I thought I would get. I was disappointed and curious after listening to the PM show, so I was very interested to check into your “outsourced” response. Frankly, there isn’t much there. They do a great job listing what the “Myths” are but the explainations are all generalities. They never directly address the claims in the PM report. For example, their facts state that “In general” child disability does not result in reduced employment for parents. That’s not what the show reported – it was that the child was pressured to stay on disability so that the family could continue to collect the disability benefits. Based on the response (or lack of) I conclude that the report was correct. Listen, I really appreciate a lot of your blogs, and frankly, I think that “White House Burning” should be required reading for all adults as well as high school students. However, I would remind you that your integrity as a worthwhile source depends on how close you stick to the facts. If this is heading towards all editorial the I have one less reliable source to turn to. The rigor of the PM content has certainly gone down with time. It is not just these simplified stories, but also the Chicago School for dummies classical bent you often hear in stories. I still listen, but I find new episodes often sit unlistened to these days. If they are having trouble generating new quality content, then they could reduce their frequency. Jounalism-to-Credibility rate is in decline. NPR is merely another mediarch. I’m glad you wrote this. I thought it was an out of character show. Not sure what to make of it, exactly. I was a tad shocked that disability could be successfully defined in ways I think most people would not accept. Food for thought. Ira Glass’ TMA has had it’s moments over the years but even before the story about the very special diet his malign little pit bull requires, I’ve had my suspicions about him and his little dog. Granted he reluctantly submitted to do that segment under pressure from subordinates but it was a foolish concession that lends further support to growing doubts regarding his judgement. PM, to my ears, has never been a credible source of economic reporting, it’s NPR doing its trendy, snark, color work around the soft edges of issues. NPR itself, once a moderate alternative to commercial radio has morphed into soft commercial radio format, with endless and frequent filler, including commercial staples like traffic reports, weather, promos, music segues and of course now full blown commercials they call sponsor messages. Corporate America couldn’t allow a non-commercial national radio network to exist so it infiltrated it with, what else, big money and whatever semblance of non-commercial information that it once contained has been blotted out by nothing of consequence. There were some things i learned from this episode.For example I didnt know there was an industry out there being paid by states to move people off the welfare roles and onto disability so that they’d get out of the state’s sphere of responsibility… Maybe it’s just me but I’ve taken npr economic stories with a grain of salt for a decade now. Leo’s comment above captures it perfectly. Make sure that *crime* pays really big, then you’ll get legal protection. It may be that the hyperlink on Media Matters was supposed to go to an article (I’m guessing this one: http://mediamatters.org/research/2013/03/22/this-american-life-features-error-riddled-story/193215) instead of simply to mediamatters.org. Thank you for this. It peeved me that TAL, of all programs, would feature a “blame the poor” story. “The poor” deserve to be blamed for not being enterprising and doing their math. In an area with over 19 million people, extracting 50 cents from everyone is what entrepreneurs know how to do. One big circle jerk and the only “cuts” that are going to be made are to those trickles of Medicare funds that might have actually gone to people who needed “known” and basic health care found during their 50,000 mile maintenance check-up – tires need rotating kind of “known”…. Seriously, how can you hide a black market economy that is bigger, badder and more protected by deregulation than what used to be the real economy? This is an epidemic disease among journalists who are poorly educated in almost everything except writing or broadcasting. It is even worse and more fallacious in reporting medical news. Hint: Listen to any news broadcast about a medical story. If you hear an individual’s name (the ‘subject’ of the story) anywhere in the first two sentences, you are getting “facile extrapolation from the individual story”. Journalists are simply NOT trained to identify the typical or representative case, whether the subject is economics or medicine. Chill, Lew. Reporters aren’t “poorly educated.” We are broadly educated. Most of us know more things about more things than almost any other kind of worker in the US. What we lack is time. Finding the right example to exemplify a national policy or problem is the hard thing. There are no short cuts. It takes luck, skill, and time. And time is what our editors, publishers, producers & etc. have taken away from us in the past decade or so. As for the practice of using a person to stand in for a lot of people, well, that’s what it takes to get an idea across to people who know less about it than we do. Experts always hate it. Experts are usually narrowly educated–or, at least, narrowly-focused. They often think their sophisticated, jargon-heavy blather is scintillating to everyone, always. But it isn’t. It is only scintillating to other experts. Which is why they often need a reporter to get their point across to non-experts. The problem is not using personal stories to make a point, it is when those personal stories are not actually representative of the issue being explicitly or implicitly generalized about. It is when telling a good story trumps telling using a representative case study. Clearly TAL is a great show, but it is all about how good the story sounds. @ their 50,000 mile maintenance check-up – tires need rotating kind of “known”…. Yea, we can win this thing!………#.(.$.*.%.&.^.@….?.>….Oohhaa…NUTS! Yeah. That happens a lot these days. I guess it always has. Here is an interesting thing related to the “Patient Protection and Affordable Care Act”. The Republican Governor of Oklahoma, who is nearly illiterate, is now confusing “executive privilege” as it relates to national security with a futile attempt not to embarrass herself with her own writings as Governor. One wonders if Mary Fallin is trying to hide her own CONTRADICTIONS/HYPOCRISY on federal health care law, or is Fallin just afraid some 4th grade teacher in Oklahoma will have her students check mark Mary Fallin’s administrative emails for spelling and grammar errors as a classroom assignment (that could take the better part of an afternoon). Knowing Oklahoma’s history of lackadaisical “journalism”, heeheehawhaw , the woman has nothing to worry about. Local Oklahoma journalists mostly specialize in stray dog stories and polling toothless idiots at Gun Shows about whether guns should be sold without background checks or not. One Oklahoma City TVanchor nearly fainted on air when a news scriptwriter unknowingly included the word “fracking” in the telecast. Bottom line is that no one has the data and it is not up to reporters to collect the data as they have no access to the super-computers collecting the minutia spending habits of immigrants or know when will the slum lord finally buy a washing machine and dryer – when there are 22 or 23 of them stuffed into a two bedroom rental? At 1.75 a load, and how many people getting a piece of that – when will it be worth it to the landlord…? Yup, “specialty” math…. Picking out the perfect one-trick pony to present the whole show is an obfuscation schtick put together by the people who actually do have the data. When there is no sword left after the battle to beat back into a ploughshare, what else is left to the insanely greedy other than to keep on hating. If a person CAN read, they would not be allowed to hold public office in Oklahoma, would they? It spoils the propaganda narrative! The kleptocrats and plutocrats using the landscape of the “social net” to get it ALL just wouldn’t have it. Resistance is not futile. The Borg went down :-)) The “Deliverance” boyz…? Makes everyone playing god of eugenics for the day decide that in an overpopulation scenario – they hold no value to the species. Example of a stat lesson for geniuses: Calculate “x” for how much more dangerous the water in the Gowanus is to people’s health than a Big Gulp. When you look at the state of the “economy” during the time USA had a BIG PLAN – the Moon – you can “study” that to see how everything was coordinated in society – the “merchandising” of it, if you will – to support the flow of currency into commerce. Why keep studying the Depression to see if it can be done better? Who is insane enough to claim a higher moral ground when a secret torture program got more funding of taxpayer $$$$ than NASA? The merchandising of the torture program is being distributed into the “economy” through for-profit health care – gee, what could go wrong there? I was just watching some old Rachel Maddow shows I had downloaded, and I am now wondering who writes most of her on air-script (I’m guessing she writes less than half of it, but that’s just a wild guess). One of the better lines I’ve heard in awhile on CPAC “it’s cable news chum”. Honest to God, the CPAC speeches and gesticulations via 1st grade class show-and-tell looked like it was organized by some non-college grad Teabagger out of the more grimy regions of Alabama. The surfeit of self-congratulation in this post is awesome to behold, just unbearable. If you’re not invoking the royal “we” to explain how welfare benefits are distributed (“that’s why we have the Earned Income Tax Credit, that’s why we have a debate every time….”), you’re counterpoints — if they can be called that — are wildly condescending (“‘Holy cow, Batman, incentives matter!” and “the story boils down to….”). Truly a tremendous post. God bless tenure, for as long as it last. Can I just say what a relief to locate an individual who really knows what theyre talking about on the net. You surely know the right way to bring an issue to light and make it very important. Extra many people really need to read this and realize this side of the story. I cant believe youre not much more well-liked given that you absolutely have the gift. No matter whether you want the latest stylish sunglasses or some new eye glasses it is all about finding a good optometrist, someone who can help you to make the right decision. Going to see an eye expert is the sensible option as they will be able to help you to make the right decision, meaning that you will be happy with your first choice. There are some great optometrists around so all you have to do is find one and you are sorted. If you take care of your eyes then they will take care of you so make sure you always see a trained expert. , all the burberry product are top qualtiy and free shipping.Enter Oakley, the go-to brand equipped with a variety of shades to fit your active lifestyle and delight your fashion flair. After all, based in Southern Cali, Oakley knows how to stir excitement among Hollywood celebs, top sports athletes and fitness fashionistas alike, offering cutting edge styles designed with revolutionary technology. Oakley prides itself in creating products that represent a commitment to excellence and fuel the imagination, allowing us to defy our own limits and perform bravely, beautifully and passionately.